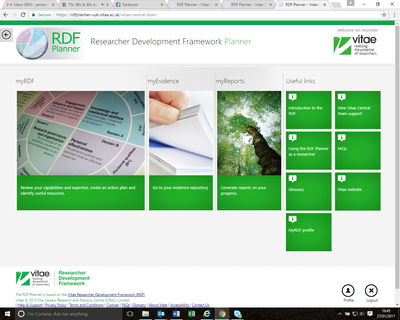 Vitae is delighted to have launched MyRDF Profile on 18 February 2017- a new RDF Planner feature to enable speedy assessment of your progress against the Vitae Researcher Development Framework. 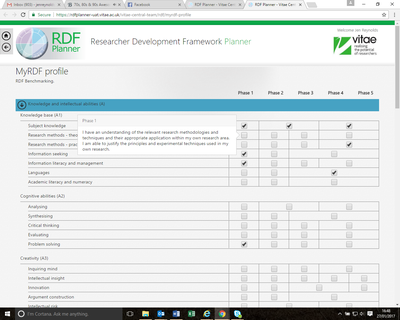 MyRDF Profile will enable you to quickly assess your development against each descriptor of the Vitae RDF, so you can immediately identify your strengths and weaknesses and make a quick start on your professional development. Once MyRDF Profile has been completed the MyRDF section of the Planner will automatically be updated with the results, ready for you to add actions to get to the next phase or to add evidence once your actions are complete. MyRDF Profile area is accessed via a splash screen during log on or from a new tile on the home page. There is an option in your profile that can be used to hide/show the splash screen on login. As you hover over each phase on MyRDF Profile, you will see a pop up box, containing the description for each phase allowing you to quickly and easily consider if you have reached that level. All you need to do is click the relevant box! You can then use MyRDF Profile to reflect on your strengths and weaknesses or discuss your development needs with your supervisor/line manager/careers office. 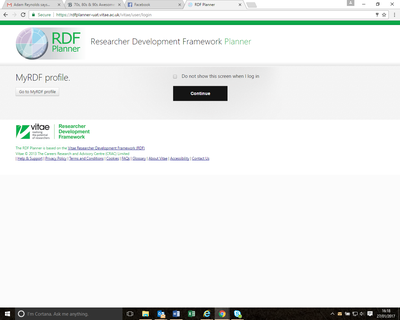 MyRDF Profile can be accessed at any point by going to your RDF Planner home page, (in the useful links section). This means you can also quickly reassess your profile at any given point, to see if your competency levels have moved to the next level as a result of your professional development activities.